УРАЛЕЦWorkers of OOO “Tractor” – for V.V. Putin! 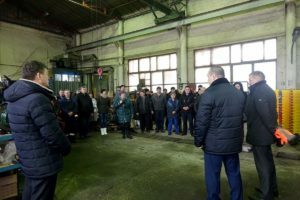 On Friday, December 8, there was a meeting of the collective of the enterprise LLC “Tractor”, during which Director Vladimir Andryushchenko announced the results of work for 2017 and outlined further prospects for development. Yevgeny Svetlov, the head of the Emanzhelinsky Municipal District, also took part in the meeting. He told the workers about the political situation in Russia and the Emanzhelinsky district. Also, Yevgeny Svetlov and Vladimir Andryushchenko talked with the workers of the enterprise about the forthcoming presidential elections in the Russian Federation, and conducted pre-election campaign in support of V.V. Putin. 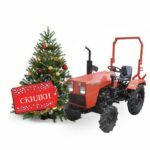 Director of the enterprise Vladimir Andryushchenko said that this year the company has mastered the production of new products, in particular, the production of a hammer mower and an all-wheel drive tractor with an improved hood and an integrated fuel tank. These novelties brought the plant two silver medals at the exhibition “Golden Autumn – 2017” in Moscow. 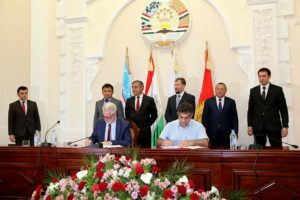 Also in 2017 the plant entered new sales markets, products were supplied to Armenia and Kazakhstan, sales in the territory of Kyrgyzstan increased, and they continued to supply cars to Latvia. – In many respects this is caused by the participation and close attention to the problems of the manufacturers of the President of the Russian Federation V.V. Putin. Owing to the export policy, it was much easier to supply products abroad, – said the director of the enterprise. At OOO “Tractor” the program of the president of the Russian Federation on import substitution is actively being implemented and many equipment that was previously purchased in other countries are being produced in Russia and, moreover, in the Emanzhelinsky district. The precision casting factory located in the Zauralsky settlement supplies Tractor with blanks for future parts, Yuzhuralautotechnology LLC supplies rubber products, including the shift lever, the KVRZ subsidiary, a trailer hitch. In total, there are 39 Russian enterprises in the list of suppliers of components.